As has been recounted here, I came to an appreciation of the land and the wild through my deprivation from it while in school in Dallas. That time provided me the opportunity to explore places I never would have otherwise and to learn to appreciate their beauty, even if it was different from the Sierra Nevada, the range I considered my mountain home. (These mountains really were home in a way: my parents met climbing Half Dome and both of their families already had a generational attachment to Yosemite by that point). My travels refined which landscapes I preferred. While the environments I found interesting continued to evolve, I developed a penchant for heading to places that people were not often aware of. As I journeyed through new places, I discovered that there was an added measure of edification in finding places of great beauty that were seen by few eyes. 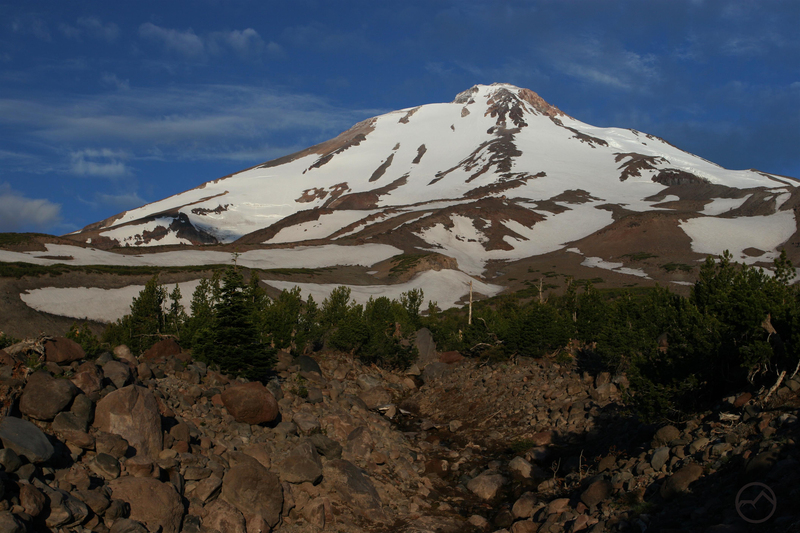 Here in Mount Shasta, there is a tremendous amount of natural beauty that has escaped attention from all but a handful of dedicated explorers. Most of these destinations have little or no information written about them, and are generally off the beaten path in a very literal way. For those who are even aware of their existence, finding sound information on these hidden jewels is next to impossible. Figuring out the best way to get there is part of the experience and it often takes multiple attempts to successful reach the goal. Is spite of this, the thrill of reaching a scene seldom seen is a rich reward for the effort expended. Mount Shasta and Brewer Creek en route to Ash Creek Falls. My favorite spot on Mount Shasta, Ash Creek Falls, is one such unappreciated vista. Granted, the falls are marked on the map and, for those who think about such things, there is an awareness of the falls but that has not translated into crowds of people visiting the falls. There are a few reasons for this. 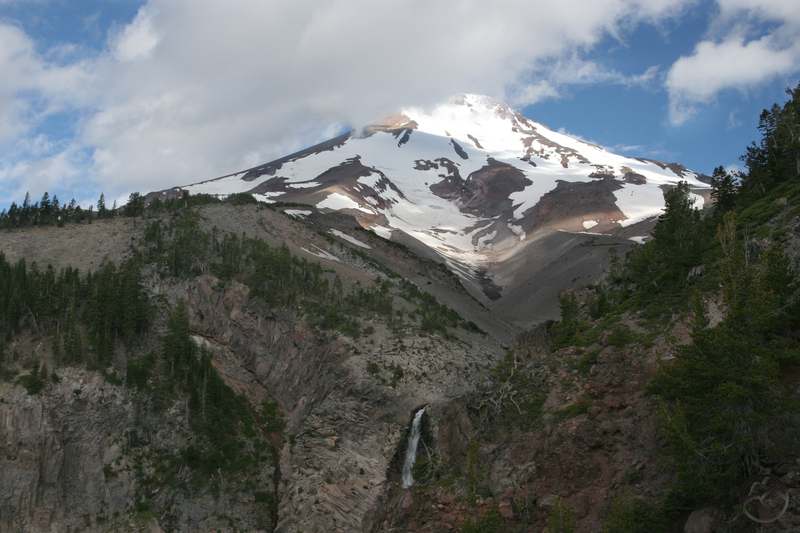 First and overshadowing all the others, Ash Creek Falls is on the east side of Mount Shasta. This is the side of the volcano that is most remote and least visited. All other sides of the mountain are, at the least, visible from a highway. The south and west sides are served by a paved road that climbs nearly to treeline. Even the rugged north side is observed from Highway 97 and accessed by two well-traveled trails, the Whitney Falls and North Gate Trails. It is the east side, home to the massive Hotlum and Wintun Glaciers, that remains out of sight and hidden away from all but the very few who make the long, rugged drive to the trailhead of the east side’s lone trail, the Brewer Creek Trail. Isolation and a lack of awareness of the falls are not the only attribute that prevents people from visiting Ash Creek Falls. The falls, or even a view of the falls is not reached by an official trail, nor is there any improvised, user created path. To reach a good view of Ash Creek Falls requires cross-country travel that necessitates good route finding skills. Even once one reaches the rim of Ash Creek Canyon, finding a safe place from which to enjoy the memorable scene requires some precarious exploration. Ash Creek Canyon below Ash Creek Falls. These challenges aside, Ash Creek Falls is a marvelous place. When the correct vantage has been found (an easy task if one knows where to look) the scene is incredible. Standing at the precipice, 400 feet above the canyon bottom, an incredible panorama awaits. The wide canyon V-shaped canyon is composed of loose scree with rocky crags protruding from the higher area on the canyon walls. Clumps of trees cling to the loose talus and strands of green grass and small brush mark the path of springs flowing down toward Ash Creek. The creek itself roils down the canyon, though it is often obscured by thick bridges of ice that completely cover the canyon bottom. Looking upstream, the canyon narrows swiftly. About 0.3 miles from the vantage point, the canyon butts into a band of hard, erosion-resistant rock. It is here that Ash Creek plunges 300 feet over the band of rock. It is a powerful yet graceful waterfall. It pours over the edge of the cliff as a horsetail, all of its power concentrated in a single channel of water. Halfway down it crashes against a bulge in the cliff face, running down a steep sluice in the rock before it shatters into multiple, wispy veils of water. 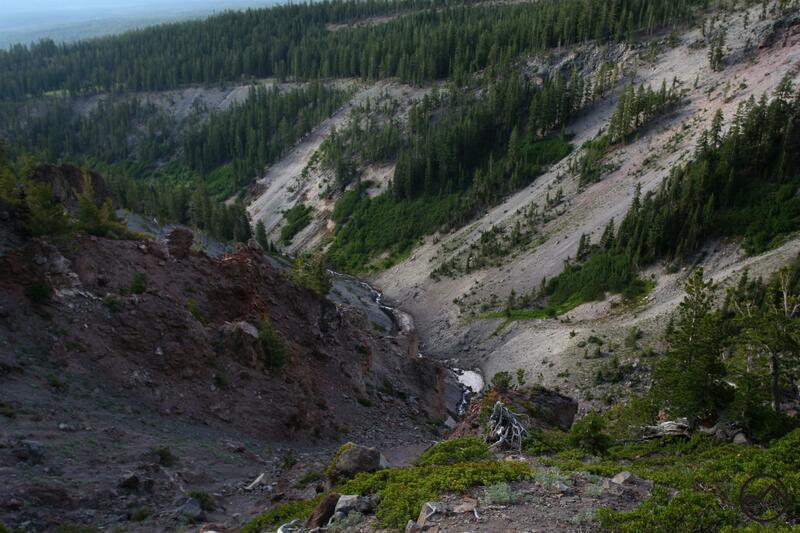 Mount Shasta and the Wintun Glacier from above Ash Creek Falls. As beautiful as Ash Creek Falls are, they are only a part of this neglected vista. 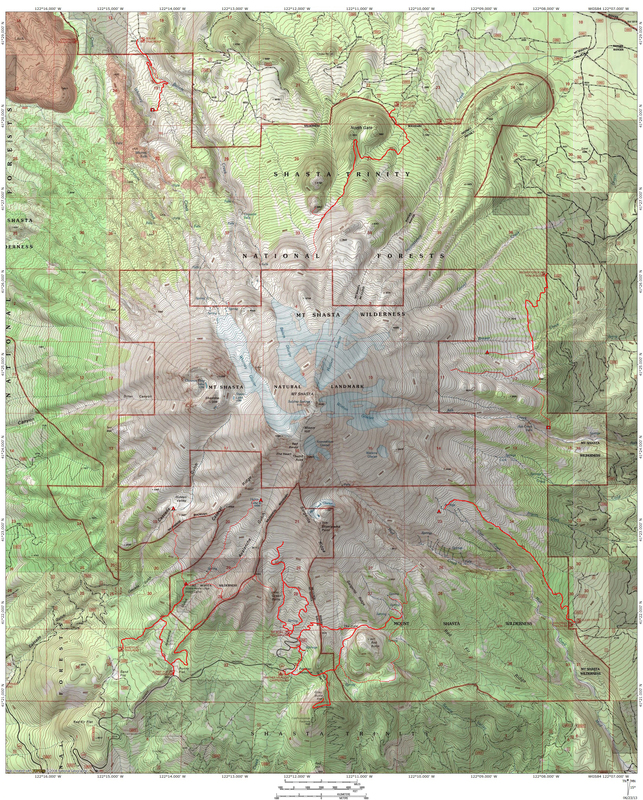 Soaring 7,000 feet above the falls is mighty Mount Shasta. 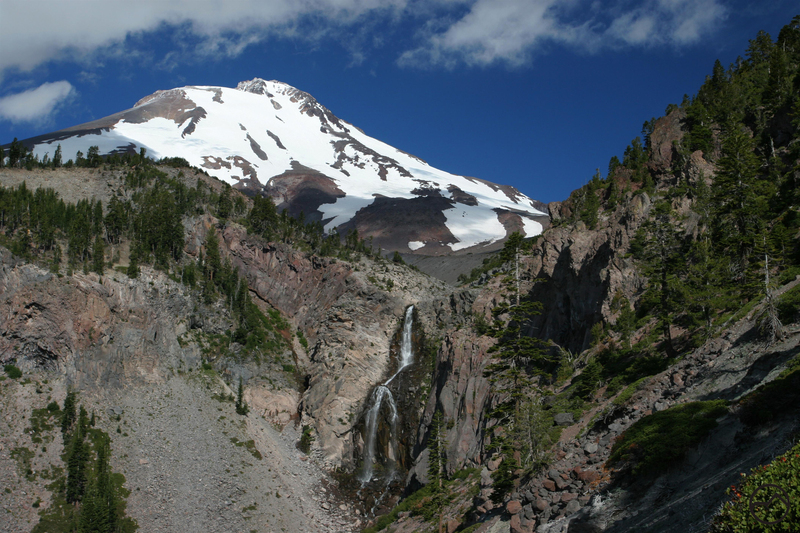 The massive volcano presides majestically over Ash Creek Canyon and Ash Creek Falls. The mountain is cloaked by the hulking Wintun Glacier, the 3rd largest and highest in California. Though the lower portions of the glacier are out of sight at the best place to observe the waterfall, the lowest point is only 1,000 feet above and 0.8 miles away from where the falls tumble over the hard band of rock. There are vantages farther up the canyon that offer better views of the glacier flowing down the canyon but they are not great places to view the falls. Though individually beautiful, taken as a whole the canyon, Ash Creek Falls, the Wintun Glacier and Mount Shasta are an epic sight to behold. It is amazing that such a view has remained so seldom seen for so long. For a waterfall junkie like me, it is particularly gratifying to have such an awesome cataract in the proverbial backyard. I am not the only one who thinks so. John Muir made several trips up to Mount Shasta and had an abiding love for California’s great volcano. The vista taking in Ash Creek Falls with the mountain looming high overhead is purported to have been his favorite view of Mount Shasta too. Beautiful photos and excellent write up!